WillCall, the San Francisco ticketing app we profiled just last week, is taking down the velvet ropes and letting customers into its app starting Thursday. The app, which is free, is available now in the iOS(s AAPL) App Store and via the web for Android(s GOOG) and Windows Phone 7(s MSFT) devices. WillCall helps people who want to make last-minute plans, specifically what kind of concert or performance they want to go to. At first, there will only be a few events listed per week, mostly for smaller venues and independent artists. 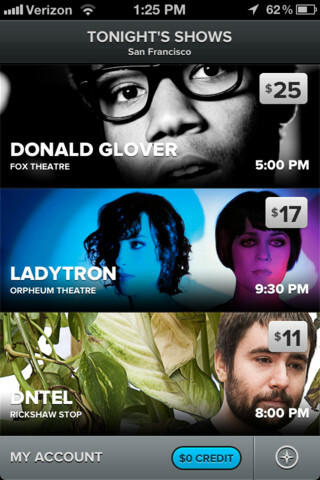 As an example, the first list of acts available in the app will be: Shabazz Palaces at Yoshi’s, VHS or Beta at Rickshaw Stop or theater piece Jesus In India at the Magic Theatre. The coolest part of WillCall — besides enabling poor planners and procrastinators of the world — is its attempt to capture the inherently social nature of concert-going. 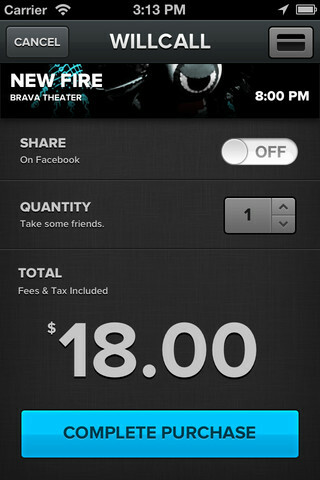 Users of the app will get a push notification and an invitation when a friend buys a ticket to an event. “We recognize that folks are generally going to attend shows in groups, and this is our first attempt to making that as easy as possible,” said co-founder Donnie Dinch. WillCall, for now, is going to be most useful for those around the San Francisco area. However, Los Angeles and New York City are on tap for launch just after the SXSW conference next month, according to Dinch. Congratulations to the entire WillCall team and Donnie Dinch! Great concept. I look forward to seeing some cool shows. This is awesome! It’s like Hotel Tonight for music!